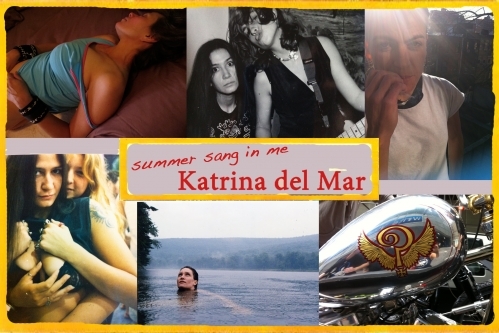 From March 7 – March 28, 2014 Strange Loop Gallery is proud to present Summer Sang in Me, a solo exhibition featuring photographs, videos and ‘zines by New York-based artist Katrina del Mar. ‘Summer Sang In Me’ is a compilation of Katrina del Mar’s intimate photographic and video portraits of lovers, ex lovers, close friends and beautiful strangers. Entwined with self-portraits and elemental landscapes, these images map out the semi-fictional road trip of her life. In no particular order Del Mar is an artist, photographer, human being, lover. Her style is realistic /romantic; messy at times, tactile, beautiful, and gritty. Her pictures are foremost captured with a taste and passion for life in general, and for women in all their individuality of beauty and power in particular. Reading like an unbound, semi-fictive yet very personal journal, the images, video clips and ‘zines make up a story of restlessness, a study in fascination verging on obsession. The insistent drive to hold onto remnants of people so as not to lose their memory results in a type of souvenir collecting of a most personal nature, and a longer temporal narrative emerges which sees participants striding in and out of the story sometimes once, sometimes many times. This exhibition serves up a softer, more romantic side of del Mar’s work, although the tough girl aesthetic clearly shines on in a series of images of planned bruises and fight-club aftermath, where tough girls proudly display evidence of their damage alongside evidence of unbridled lust. Her solo exhibition GIRLS GIRLS GIRLS was presented in January 2013 at Participant Inc. in New York. Her solo exhibition, Gangs of New York was presented in 2010 at Wrong Weather Gallery in Porto, Portugal. Invited to teach at the University of the Arts in Bremen, Germany, she conducted the first ever “Queer Trash Feminist Film Workshop,” also in 2010. In 2012, she presented a series of films and photographs from the Golden Age of Performance Art (1988-2000 with Dona Ann McAdams, On the Edge of Society: Moments in Live Art, at Warehouse 9, Copenhagen, Denmark. Her work has shown at Deitch Projects, NY; Museum for Contemporary Art (CAPC), Bordeaux, France; American Fine Arts Company, NY; Binz 39, Zurich, Switzerland; Bass Museum of Art, Miami; Miami Light Project; P.S.122, NY; FabLab, Berlin; and the University of Cardiff, Wales. Her first film, Gang Girls 2000, shot entirely on super 8mm film, received a four and a half star review in Film Threat magazine, among other glowing reviews, inviting comparisons to the legendary Kenneth Anger. The follow up, Surf Gang, about a gang of women surfers from Rockaway Beach, landed del Mar a fellowship in video from the New York Foundation for the Arts, “Best Experimental Film” from the Planet Out Short Movie Awards announced at the Sundance Film Festival 2006, and was screened at the Museum for Contemporary Art (CAPC), Bordeaux, France. Her latest film project, Hell on Wheels Gang Girls Forever, completes the Girl Gang Trilogy and was the recipient of the 2010 Accolade Award of Merit. Recent screenings include Girl Gang Trilogy, Nightingale Cinema, co-presented by Chicago Underground Film Festival, 2012; Super 8 Film Portraits, curated by Stephanie Gray, Millennium Film Workshop, NY, 2012; Surf Gang (excerpt), Sound & Light, and winner of Juried Competition, Schoolhouse Gallery, Provincetown, MA, 2012; Girl Gang Trilogy, Fringe Film Festival, London, UK, 2012; and Girl Gang Trilogy, Bio Paradis, Reykjavik, Iceland, 2012.